The last time we visited my Embroidery Archeology project, it was all about preliminaries – the things you should do before delving into the … uh… destruction? (for lack of a better word!) of an old piece of embroidery like this. Now, now, before you balk! I’m not destroying it. I’m doing my best to conserve every conservable part of it. 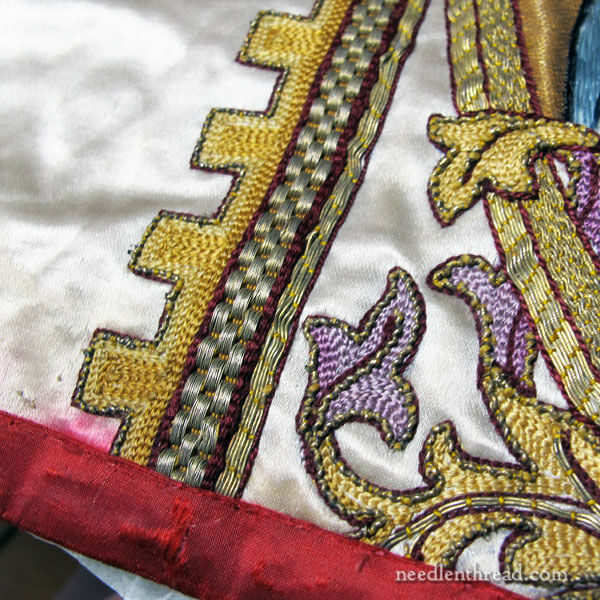 As I explained in the initial backstory – which you can read here – my primary goal is to retrieve the figure embroidery from the piece, and salvage those so that they can be used on real vestments. If possible, I also plan to salvage some of the floral elements, though for what use, I’m not sure yet! With the preliminaries out of the way, it was time to take the piece apart. Typical of this type of vestment, the embellishment on it is worked primarily in chain stitch. At first, you might be tempted to think that it’s done with a tambour hook. 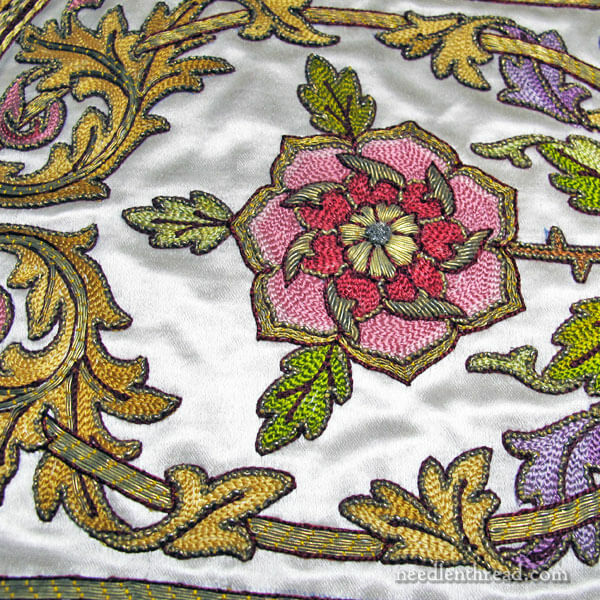 The tambour hook is certainly a possibility, as it is a relatively quick way to achieve hand embroidered vestments. But there’s another alternative to tambour work that produces this look of hand embroidery without actually being hand embroidery – yes, a machine! And not just any machine. This type of work, machine done, was done with a Cornely machine, one of the very first embroidery machines. Is it machine done, or is it hand done with a tambour needle? The only way to find the answer to this question is to examine the back and make some assumptions. The embellishment on the cross (the whole embroidered element around the figures) is a combination of chain stitch (the crenelated outside edge and all the foliage), couched goldwork highlights, some chip work (with metal threads), and an applied galloon, or pre-made trim that sports gold threads. In this case, the gold threads on pretty much the whole piece have oxidized quite a bit. There are a few areas on each piece of figure embroidery where the foliage that decorates the cross overlaps the frame around the figure and encroaches on the figure itself, more or less appliquéd onto the figure. This part can be tricky – I want to remove the foliage, but I want to avoid damage to the figure. At the same time, it’s extremely likely that the removal of the foliage here will leave marks on the figure. In that case, whether or not I have to cover up this part of the figure in the final finishing will depend on how visible the marks are. And so, the back comes off! Not a very big deal – the red silk back was lightly slip-stitched to the front. With a sharp seam ripper, it was just a matter of making a few key slices through the threads, and voilá! Once you see the back, you get a pretty clear idea of the structure of the piece. The entire figure part is appliquéd to the floral cross from the back – reverse appliqué – and then bits of the floral elements are worked over the edge of the goldwork frame on the figure. We’ll look at the whole layering process once I get the figure off its background. 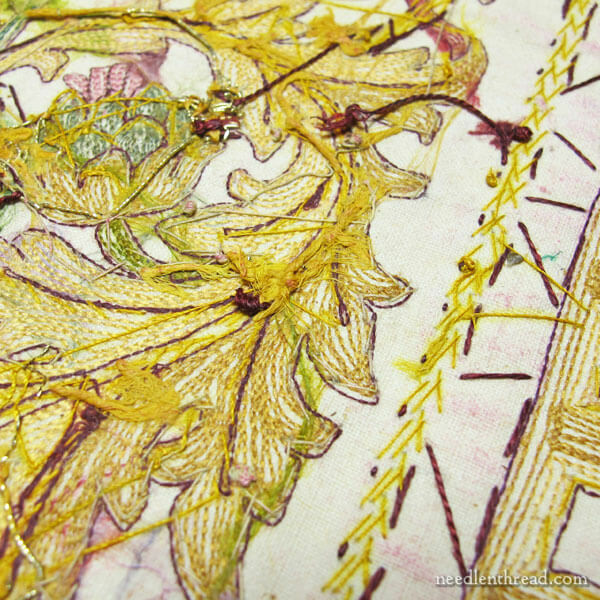 Here’s an image of the back of the chain stitching and couching threads for the goldwork, as well as some appliqué threads for the elements on the front. Here’s the back of the rose. You can see the dark red outline threads there. They are around all the embroidered elements. Just to give you an idea of some of the layout from the back, you can click on that photo above to get a larger view. Some things of note: You can see where the galloon (or pre-made trim) is sewn down in that blank strip that says “galloon.” You can also see the yellow threads used to work the goldwork strip just inside the galloon. You can clearly see the edge of the figure appliqué. 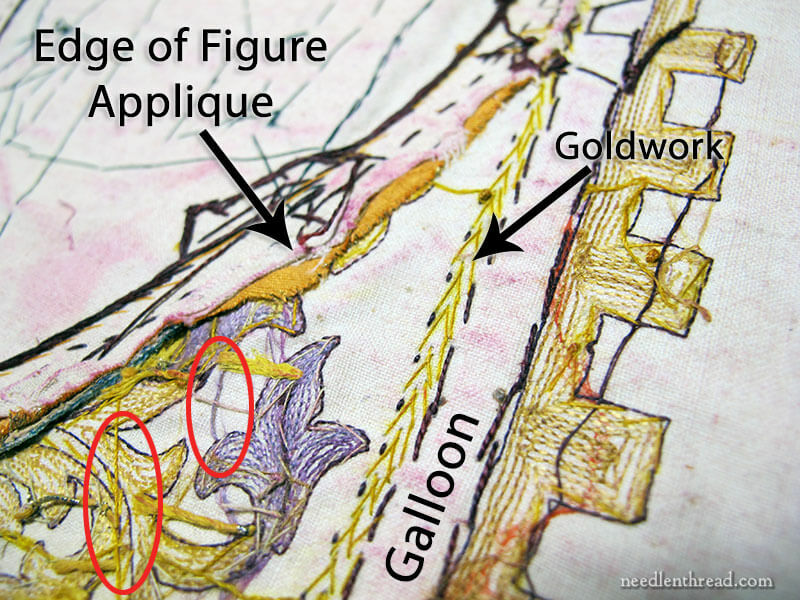 Notice that there are no goldwork threads in that area, that indicate the goldwork frame around the figure. Normally, you wouldn’t expect to see the edge of appliqué on the back of a piece. In this case, the process is more of a reverse appliqué. We’ll see how that works once the figure is completely off. Notice the red circles in the photo above. Those are carried threads from one area of chain stitching to another, worked in the same color. I’ve yet to get a good shot of the beginning or the end of any of the chain stitching, but I’ll take a leap here and say that this chain stitching is machine done. Pretty much no doubt. It comes from the right era, it was an “inexpensive” and faster way to produce “mass-produced” (no pun intended!) vestments, and it just seems more reasonable that it would have been machine embroidered – as far as the chain stitch goes – and then finished by hand with the goldwork and trim. In the photo above, I’ve started pulling out some of the clipped silk threads that edge the embroidery on the front of the figure around the frame and that serve as appliqué threads as well as outlines. This week, I’ll be devoting several more hours to this piece, and hopefully, I’ll get the figure completely off. At that point, I’ll try to make up a sensible graphic for you that gives you a clear idea of the layering and the order of work in the whole piece. It might take a little more computer genius than I actually possess – but there’s nothing wrong with trying! I’m glad you unravelling this piece an interesting investigative project I do hope you find a use for the floral bits as they are lovely. I’ve just read the article on the Cornely Machine which is interesting as I had not heard of the machine before. Thanks for sharing with us the update on the Embroidery Archaeology project I’m sure you will enjoy this project. Hi, Anita – Yes, I think the Cornely machine is pretty fascinating, myself. I’d Looooooove to have one! Actually, I’d like to have one of those and one of the old machines that couched gold threads. I only know three of the latter in existence – one is in Chicago, one is in Missouri somewhere, and the other was in Missouri at one point, and I don’t know who bought it up when the convent that owned it dissolved. In any case, I wouldn’t have anywhere to put anything like that, but I’d sure love to see them in operation in person! yes it would be really interesting to watch them in operation I wonder if there are any in the UK I will have to do some research. I’ve just seen one available in the UK from Tyson Industrial Sewing.co.uk for £2,994 to buy or cash and carry £2395. You can go and try it before you buy it. There you are you can buy it, it also does Africian Bu Bu clothing whatever that is. It’s fascinating to see the back of the embroidery, especially that the figures were added by reverse applique and that the chain stitch is definitely not done by hand. I agree it would be interesting to find the beginnings and endings of the chain stitch and work out how they moved from row to row. Interesting. A better word would be ‘deconstruction’. More methodical and analytical. Destruction sounds too brutal. What about deconstruction instead of destruction? Thanks for this, Mary it’s very interesting. Thanks for the update Mary. I just finished looking through the RSN Applique Book so this topic is quite timely. I’m fascinated by the layering and padding used to create dimensions and form in these pieces. It is amazing what you can learn when you see the inside of the work. This is fascinating. Thank you for sharing this journey. I’m glad you like it, Kathy! It’s quite a challenge, now that the real “unpicking” has commenced! In one of my classes, a woman had found a Cornely machine while tidying up for an aunt who had passed. Unfortunately, she was not the first on the scene, so the manual and some other bits had already been tossed. She was very excited to receive the machine and brought an armload of things she tried with it. The very next week in another embroidery class, another student had a Cornely manual. We copied it and sent it to the woman with the machine. What serendipity! Cornely makes new machines, but the old ones look wonderful (sort of like my sewing machine). I’d love one too. No room for it, but I sure would like to play. I think you’re very brave to attempt this project. And it’s very interesting to see your progress. Fellow blog followers may be interested in knowing more about the machine used to create the chain stitch embroidery. Tim Latimer, is a quilter and antique/vintage sewing machine collector who recently acquired sucha machine. He talks more about it on his blog “TimQuilts”. I am so interested in this project, thank you so much for taking the time to explain not only what you are doing but supply photos etc. It will be wonderful to see it move toward completion. Thanks for the up date. Dear Mary, I understand your wanting to know whether the chain stitch was done by hand or by machine. 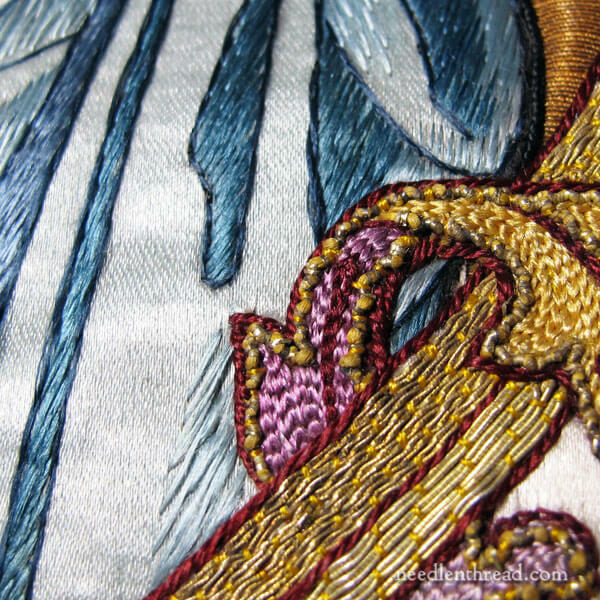 3) In general when a machine is used to do chain stitch, it’s the only stitch on the whole embroidery. You’ll see many such examples of modern suzanis and chapans from Uzbekistan if you search on ebay. These Cornely machines are very greedy, in that once you’ve started you can’t stop until the whole cloth is covered with embroidery. Where there used to be solid ground done in Bokhara couching stitch in silk thread, now it’s done in shiny viscose machine chain stitch. I’ve seen this machine at work in an African workshop. Some operators are very talented but it’s machine. 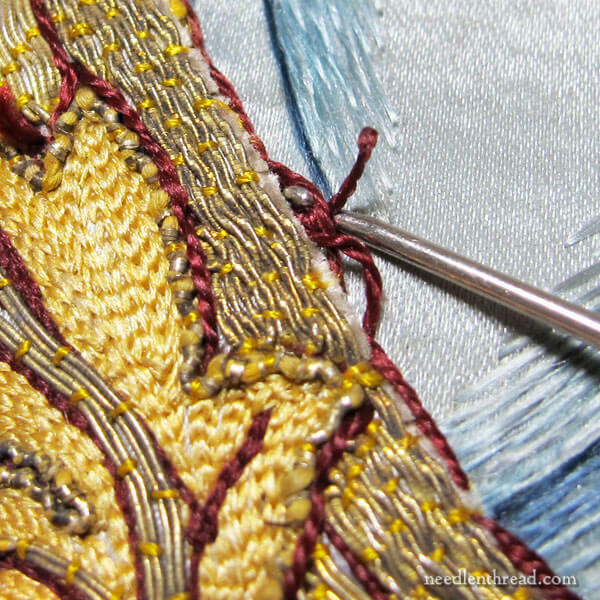 It’s an interesting effect when chain stitch is used as a filler but only in small doses! Hi Mary and Brigitte. I did wonder if the chain stitch was perhaps done with a tambour hook. It would also give the very neat appearance on the back, with the thread going in and out of the same hole on each stitch. So fascinating to see the back of the embroidery. Thanks Mary! and jackets because a lot of the embellishment looks to be down in a chain embroidery which looks machine made. I am assuming it is done with this machine??? Yes, I would love to have one as well…..Keep up the great work Mary. Hi, Jane – Not sure! It would depend, I suppose, on the gown, the “house” that made it, etc. I know with vestments the Cornely machine had a huge influence, because it sped up the process of producing embroidered vestments, and, in many cases – even in many of the convents at the turn of the century and into the early half of the 1900’s – they could work in an “assembly line” style, with some things worked by hand, some worked by machine, with different skill levels assigned to different parts of the embroidery. There was even a machine used for couching double lines of gold thread used by one of the Benedictine convents here in the midwest well known for their embroidered vestments. 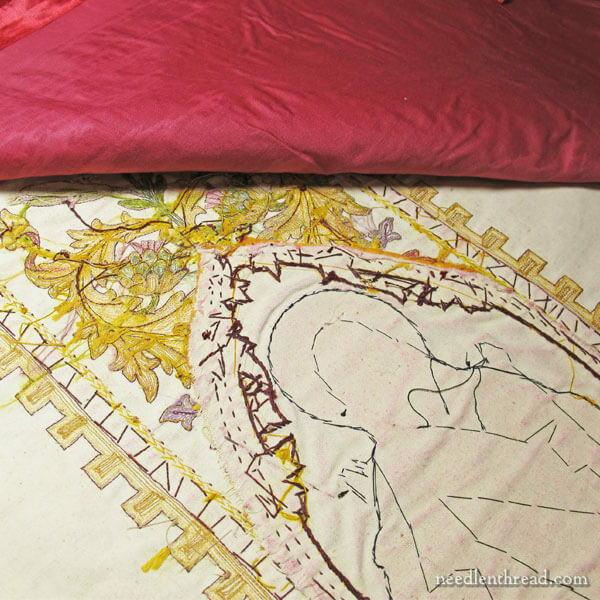 So in some cases, you’d see magnificent needlepainting and very intricate hand embroidery alongside huge swaths of couched goldwork that was actually couched by machine. I’m not sure how this played out in houses of fashion, but I would imagine that, in some cases, machine stitching did play a role in the industry. Still, I think the higher end couture houses probably prided themselves – as some still do – in hand embroidery over machine embroidery. So it really depends. The tambour needle was prevalent, too, and it still is. 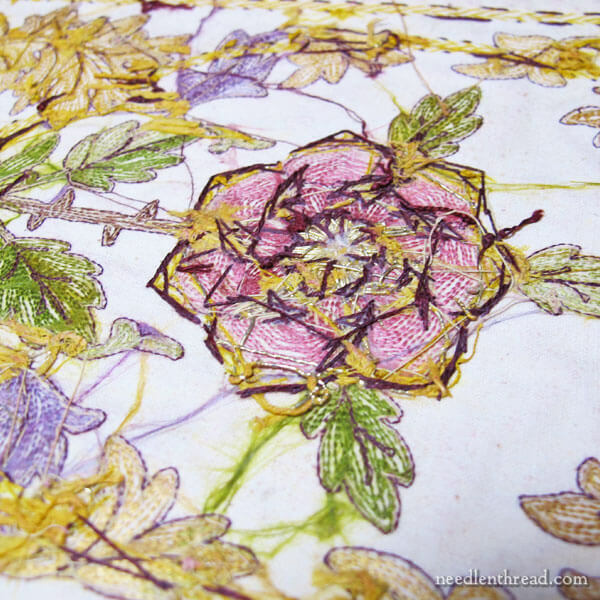 Previous Previous post: What’s in my Embroidery Rotation – and What’s Not! Next Next post: Embroidery Workroom Organization – Not There Yet. But….